As funeral directors we are proud to offer the complete service of the highest integrity that only a privately owned, independent family business can give. Serving the Conwy Valley, Colwyn Bay and Rhos On Sea, and surrounding areas we provide a 24 hour service and are able to offer our services in both English and Welsh. We have Chapels of Rest at both our Llanrwst and Mochdre premises, of which our Chapel at Llanrwst is able to accommodate a full funeral service, should a bereaved family not wish to have a service at their local church or chapel. Suffering the loss of a loved one, whether expectedly or unexpectedly, can be an emotionally traumatic experience and can leave you wondering which way to turn. When you turn to us we can take away all the burden of arranging the funeral. Upon contacting us we will take a few brief details from you and then arrange to meet you, often in the comfort of your own home, to discuss the details of the funeral and give advice on registering the death. At the time of a bereavement a day or night service is provided. Our philosophy is that we are not here to persuade bereaved families to select expensive coffins by hard sell methods at a time when they are emotional and vulnerable. 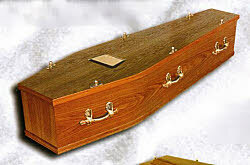 We believe that our traditional Oak veneer coffins are very dignified and respectable. However, we can offer a wide selection of coffins from various traditional styles, to coffins with unique designs if desired. In addition to the traditional Funeral Service, we are able to offer Golden Charter Pre Paid Funeral Plans, which are becoming increasingly popular these days. The Golden Charter prepaid funeral plans are a caring and reasonable way of dealing with funeral arrangements and each plan can be adapted to suit each person's wishes. To find out more about the Golden Charter plans, simply contact Robin Roberts who will be pleased to help you.